In the early 20th century, poets and artists broke free from traditional forms. 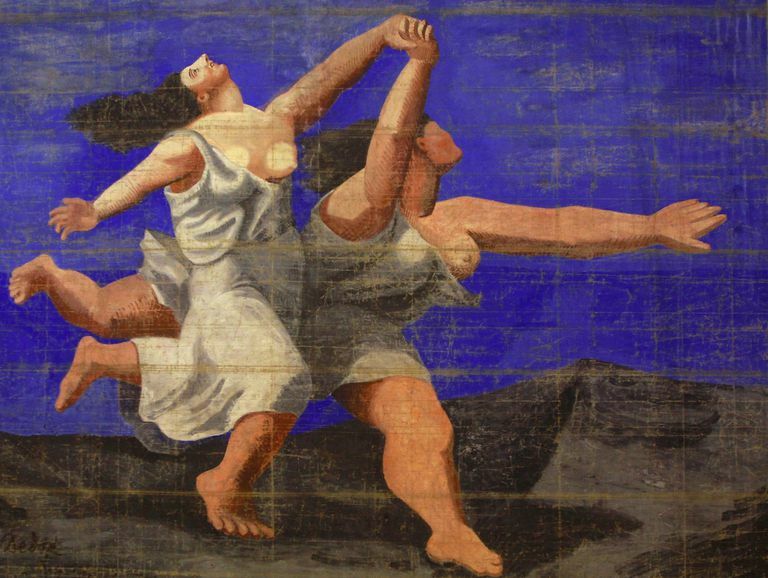 Pablo Picasso: Theater backdrop for a Ballets Russes performance of "Le Train Bleu" (cropped). Photo by Peter Macdiarmid via Getty Images. Free verse poetry has no rhyme scheme and no fixed metrical pattern. Often echoing the cadences of natural speech, a free verse poem makes artistic use of sound, imagery, and a wide range of literary devices. Free verse: Poetry that does not have a rhyme scheme or a consistent metrical pattern. Vers libre: The French term for free verse. Formal verse: Poetry that is shaped by rules for rhyme scheme, metrical pattern, or other fixed structures. Free verse is an open form, which means it has no predetermined structure and no prescribed length. Since there's no rhyme scheme and no set metrical pattern, there are no specific rules for line breaks or stanza divisions. 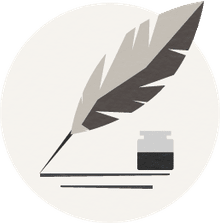 Other free verse poems succeed at expressing powerful emotions through run-on sentences, hyperbolic language, chanting rhythms, and rambling digressions. Perhaps the best example is Allen Ginsberg's 1956 poem "Howl." Written in the tradition of the Beat Movement of the 1950s, "Howl" is more than 2,900 words long and can be read as three strikingly lengthy run-on sentences. Highly experimental poetry is also often written in free verse. The poet might focus on images or word sounds without regard to logic or syntax. Tender Buttons by Gertrude Stein (1874–1946) is a stream-of-consciousness collection of poetic fragments. Lines like "A little called anything shows shudders" have perplexed readers for decades. Stein's startling word arrangements invite debate, analysis, and discussions on the nature of language and perception. The book often prompts readers to ask, What is a poem? was sinking back into the earth. With so much variation and so many possibilities, it's no wonder that free verse has stirred confusion and controversy in the literary sphere. In the early 1900s, critics riled against the rising popularity of free verse. They called it chaotic and undisciplined, the mad expression of a decaying society. Even as free verse became the standard mode, traditionalists resisted. Robert Frost, a master of formal rhymed verse and metrical blank verse, famously commented that writing free verse was like "playing tennis with the net down." A modern-day movement called New Formalism, or Neo-Formalism, promotes a return to metrical rhyming verse. New Formalists believe that systematic rules help poets write more vividly and more musically. Formalist poets often say that writing within a structure prompts them to reach beyond the obvious and to discover surprising words and unexpected themes. To counter this argument, proponents of free verse claim that strict adherence to traditional rules stifles creativity and leads to convoluted and archaic language. A landmark anthology, Some Imagist Poets, 1915, endorsed free verse as a "principle of liberty." Early followers believed that "the individuality of a poet may often be better expressed in free-verse" and "a new cadence means a new idea." In turn, T. S. Eliot (1888–1965) resisted classification. Free verse mingles with rhyming verse and blank verse in Eliot's book-length poem, The Waste Land. He believed that all poetry, regardless of form, possesses an underlying unity. In his often-quoted 1917 essay, "Reflections on Vers Libre," Eliot stated that "there is only good verse, bad verse, and chaos." Let him kiss me with the kisses of his mouth — for thy love is better than wine. Thine ointments have a goodly fragrance; thy name is as ointment poured forth; therefore do the maidens love thee. Meanwhile, in France, Arthur Rimbaud and a group of symbolist poets were dismantling long-established traditions. Rather than regimenting the number of syllables per line, they shaped their poems according to the rhythms of spoken French. By the dawn of the 20th century, poets throughout Europe were exploring the potential of poetry based on natural inflections rather than formal structure. The new century provided fertile soil for literary innovations. Technology boomed, bringing powered flight, radio broadcasting, and automobiles. Einstein introduced his theory of special relativity. Picasso and other modern artists deconstructed perceptions of the world. At the same time, the horrors of World War I, brutal factory conditions, child labor, and racial injustices spurred a desire to rebel against social norms. The new modes of writing poetry were part of a larger movement that encouraged personal expression and experimentation. The French called their rule-breaking poetry vers libre. English poets adopted the French term, but the English language has its own rhythms and poetic traditions. In 1915, poet Richard Aldington (1892–1962) suggested the phrase free verse to distinguish the work of avant-garde poets writing in English. H.D. 's contemporary, Ezra Pound (1885–1972), championed free verse, believing “No good poetry is ever written in a manner twenty years old, for to write in such a manner shows conclusively that the writer thinks from books, convention and cliché, and not from life." Between 1915 and 1962, Pound wrote his sprawling epic, The Cantos, mostly in free verse. For readers in the United States, free verse had special appeal. American newspapers celebrated informal, democratic poetry that described the lives of ordinary people. Carl Sandburg (1878–1967) became a household name. Edgar Lee Masters (1868–1950) won instant fame for the free verse epitaphs in his Spoon River Anthology. America's Poetry magazine, founded in 1912, published and promoted free verse by Amy Lowell (1874–1925) and other leading poets. Today, free verse dominates the poetry scene. Twenty-first century poets chosen to be the Poets Laureate of the United States have worked mainly in the free verse mode. Free verse is also the preferred form for winners of the Pulitzer Prize for Poetry and the National Book Award for Poetry. In her classic text, A Poetry Handbook, Mary Oliver (1935– ) calls free verse "the music of conversation" and "time spent with a friend." Beyers, Chris. A History of Free Verse. University of Arkansas Press. 1 Jan 2001. Childress, William. "Is Free Verse Killing Poetry?" VQR (Virginia Quarterly Review). 4 Sept 2012. https://www.vqronline.org/poetry/free-verse-killing-poetry. Eliot, T.S. "Reflections on Vers Libre." New Statesman. 1917. http://world.std.com/~raparker/exploring/tseliot/works/essays/reflections_on_vers_libre.html. Lundberg, John. "Why Don’t Poems Rhyme Anymore?" HuffPost. 28 Apr 2008. Updated 17 Nov 2011. https://www.huffingtonpost.com/john-lundberg/why-dont-poems-rhyme-anym_b_97489.html. Oliver, Mary. A Poetry Handbook. New York: Houghton Mifflin Hartcourt Publishing Company. 1994. pp 66-69. Warfel, Harry R. "A Rationale of Free Verse." Jahrbuch für Amerikastudien. Universitätsverlag WINTER Gmbh. 1968. pp. 228-235. https://www.jstor.org/stable/41155450. What Makes Great Poetry, and Who Are Great Poets? What Is Iambic Pentameter and How Is It Used in Shakespeare's Writing?